First off let me apologize for the delay in communications on our end. The staff at Rigid Bicycles has been very busy lately; the engineering team was lending a helping hand with the latest (and next-to-last) space shuttle launch, the marketing team was trying to brainstorm ways to spin Lance Armstrong's upcoming doping defense, and the CEO took a few days off for the baby. Mother nature is amazing: I look with awe on the movement of the ocean's currents, the methodical creep of glacial progress, the first sprouts of spring's flowers, and the birth of a baby. I am thrilled that all is well, the mother and the baby are healthy and recovering comfortably. We have a brand new baby girl to be thankful for; so add that to the list of things like mexican food and peanut butter. or even just New Edition for that matter. I was able to eek out a couple rides over the past couple weeks and thought you might like just a little documentation. Are you like me? Do you like the singletrack? and the mountainish style bicycles? That twisty thread of dirt in front of me is what keeps me grounded these days. Pretty fun stuff. Since the last time I digitally scribbled on these pages a few notable things have gone down in the bike world. The Tour of California wrapped up so let me offer a hearty congrats to the participants. 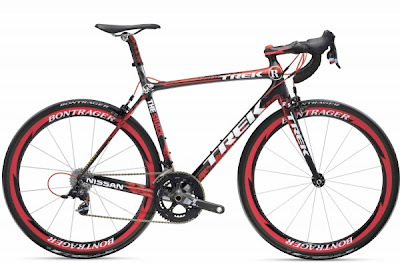 Also, the Trek corporation announced a bicycle styled cycle collaboration with visual artist dynamo, Shepard Fairey. I am not sure how I feel about this, although it reminds me of the "game-ified" branding techniques like those contests that marketing teams create to see how many product labels children can collect (cereal), or contests to see who can frequent a business place as many times as possible (mobile phone app "foursquare"), or prizes that are hidden, but pictured, inside the actual product (cracker-jacks). Maybe by cross pollinating the design and marketing seedbeds of the bicycle industry with the those of the street-art industry there may arise a new thirst for bicycles and bike lanes and outdoor recreation facilities and race coverage; but I pretty much feel like all it's going to really do is create a contest, measured in part by new triathalon entries, to see how many power broker business types will let the golf clubs sit in the closet for a bit and put in some miles on their new $10,000 bicycle. Oh well, we'll see. And by the way, if this is actually interesting to anyone, I think I remember reading a more artfully crafted commentary about bicycle "collabos" written by the Bike Snob a few years ago. Oh yeah, here it is. Well, thanks for reading about babies, bikes and boy bands. That's it for another week at Rigid, hope all is well on your end, and feel free to send in some evidence of the single track from your corner of the planet: I'll post it up right here for all of us to share. Ahhhhh, sharing feels good.